Molly was present at an earlier Barrie CARP Chapter meeting and is a current resident of the Barrie and wishes to be the first resident in the Barrie Co-Housing project. Watch her discussion taped when she met with Gwen Kavanagh, President of the Barrie CARP Chapter and Chairperson of the Senior Housing Committee for Barrie CARP. Click on MOLLY to hear Molly’s story and further understand this very important project. 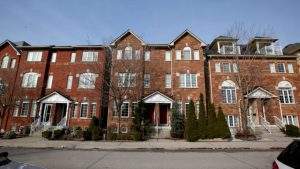 So Happy Together; Can a revolutionary senior co-housing model work across Canada? The definition of Co-housing as per CMHC refers to a housing arrangement where two or more individuals, often unrelated, share a home. While each resident has a private space, co-housing residents typically share common areas, such as a kitchen and a living room. Co-housing can be an option for seniors who are no longer able to live alone or who want companionship but who wish to remain integrated in the community. Sharing a home allows residents to help each other when they need assistance, can mean lower housing costs and related expenses compared to what each would incur when living alone, and can help seniors avoid isolation. However, some may not be comfortable with such an arrangement, and care needs to be exercised in selecting a person(s) with whom to share housing. The Barrie Chapter of CARP has created a Senior Housing Committee to focus on solutions for the shortage of senior housing in Barrie. Rather than taking a scattered approach, the committee decided to focus on one viable solution at a time. Currently the Committee is focusing on the concept of Co-housing. So that you have an understanding of the concept – the idea, which has been put into practice in Bracebridge, Ontario is to find and create suitable accommodation for seniors that is an affordable alternative to the usual retirement home, which can be very expensive and which can lead the seniors to feel excommunicated from society in general, especially in larger establishments. The idea is to use single family homes in areas zoned for single family dwellings. The concept is to take or build a single family home which will be sold to four (or more) people each of whom will take a percentage interest ownership in the home. That percentage would be determined by the comparative areas of individual bed/sitting rooms including ensuite. For example, if the total square footage of the individual “suites” is 1400 square feet and there are four “suites” two of 400 sq ft, and two of 300 sq ft the respective ownership interests would be about 20% for each of the 300 sq ft units and about 28% for each of the 400 sq ft units. All these ownership interests would be registered on title with each owner having their own deed of their percentage interest. There would be a co-ownership agreement giving them the exclusive use of their “unit” and right, in common with the other owners, to use all of the general and common areas (e.g. the kitchen and living room). There would be no cooking facility in their rooms and they would have the lunch and diner meals cooked for them by a service provider retained by the group. The same service provider might also provide transportation and other services as required. The Committee was created with the approval and urging of the Barrie CARP Chapter 36 Board to advocate for the concept. The Board Chairperson, Gwen Kavanagh Chairs the Committee and regularly reports to the board and to CARP members as to the progress of the initiative. Chapter 36’s role is to advocate for, not to finance the project. The Committee is attempting to build a model for people to see and it is felt then the concept will take on its own life. Not only will the resident retain ownership, they will reduce the costs for monthly services for example a house “coordinator” who cooks, cleans, arranges transportation and repairs etc. and this cost would be shared by the residents. The Committee has approached the Barrie Planning Department to firstly inform them of our intentions and to navigate through any potential roadblocks that may arise during the planning and development stages. Currently the Committee is working on presenting the concept to the public with the view to finding investors and buyers (which could be one and the same). Shelley Raymond, Solterra Co-housing Ltd.